The media image of an entrepreneur is usually a ‘lone wolf’, an opportunist, someone whose intuition is used to exploit either theirs’ or others’ ideas. Despite stereotyping there’s probably an element of truth. The question is, once inside a business with a formal structure, can you replicate this ethos to drive a business strategy? And perhaps just as importantly, should you? The short answer to whether entrepreneurship can be replicated is yes and to ensure this happens your company would need to have the following characteristics based on research and evidence of the last 30 years. Innovation – as long as your business is supporting new creative process and product ideas, there should be a healthy stream of initiatives to change the company for the better. This innovation doesn’t have to be ‘new to the world’, just different enough for your company to change the way you work and how you interact with customers. Proactivity – having ideas is one thing but beating the competitors to the punch can be key to exploit the full potential of your ideas. And even if not first, decisive action in reacting is a key determiner of success. Risk taking – your company will likely need to change direction internally or externally at some point to be market leader. A ‘managed risk’ approach is critical, so that the key risk factors are known, but the mitigation is planned and executed. Risk taking is not a jump into the unknown, or at least it shouldn’t be. Autonomy – your organisation must have a structure enabling people with ideas to carry them through to completion. Every company has its own distinct structure, but it needs to ask itself if this supports independent action. This is not endorsing flights of fancy, but permission to those who may need to go outside the usual structures to make things happen. Aggression – the willingness in tackling your competitors head on is a mindset that many entrepreneurial companies have. ‘Blue ocean’ strategies can help you on how you compete, but ultimately there are still competitors to tackle even if they are slow off the mark initially. So, to be considered entrepreneurial companies need all of the above. The strength of each element required however will depend on the markets served, industry and nature of the company. 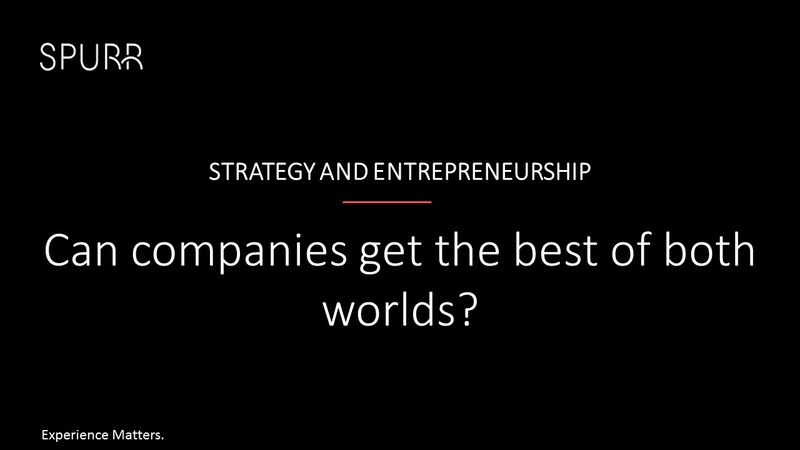 And therein lies the answer to the second question about whether entrepreneurship should drive strategy. Scale, age, market dynamism etc. will determine the degree of entrepreneurship in the strategy recipe. One things for sure however, if entrepreneurship is not in the corporate DNA, long-term success is very unlikely.